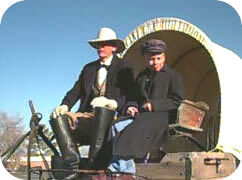 In 1997, Daniel was in fifth grade and traveled with his family on the Mormon Trail Trek. He was busy with chores and either rode a horse or walked. Biography: Dan has been on three other wagon trains, two in Idaho and in 1996 left Nauvoo, Illinois and ferried across the Mississippi and traveled to Winter Quarters, Nebraska. Daniel is named after his great great great grandfather, George Whitaker, who drove a team into Salt Lake Valley. Daniel will be traveled with his mother and father and two older brothers and his five year old sister. Daniel had chores to do each day and either rode a horse or walked most of the way. Daniel enjoys soccer, football and wrestling and helps with farm chores at his home in Midway, Utah.